The Palms at Casey Key is an infill property development which has cornered a prime South County location in Osprey, resulting in ideal buying alternatives to homes for sale in Sarasota and Venice. The parcel that this community occupies is off Old Venice Road only some 200 meters northeast of the junction of South Tamiami Trail and Blackburn Point Road, a corridor leading westward to the popular beach destination Casey Key. Several well-established communities flank homes for sale in the Palms at Casey Key, including The Cottages of Rivendell directly adjacent north of this development and the sprawling neighborhoods of Willowbend towards the south and east of it. The development of the Palms at Casey Key is a project of CalAtlantic Homes, the Builder magazine’s choice as the 2016 Builder of the Year. 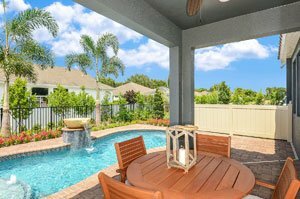 CalAtlantic, the resulting entity from the 2015 merger of Ryland and Standard Pacific, has been acquired in 2016 by Lennar, thus creating an even more enhanced synergy of builders behind the homes for sale in the Palms at Casey Key. The residences of this community could be as highly prized as those in prime communities which are popular destinations for Sarasota or Venice homes for sale. For one thing, there is this sense of exclusivity at the Palms of Casey Key which has just 31 home sites. All are platted along a single internal street—Conchfish Lane—which ends east in a cul-de-sac with a serene pond next to it. CalAtlantic has six home designs set for this property, providing a choice on one or two-story builds. 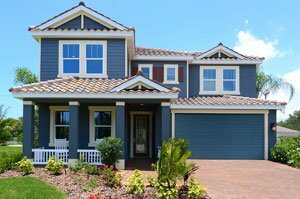 Charming with their Craftsman style, tile roofs and paver driveways, the options include residences having floor areas ranging from 1, 866 to 2,902 square feet. They feature layouts of three up to five bedrooms, two to three bathrooms, and two- to three-car garages. The price points of homes for sale at the Palms at Casey Key start from the low $300s and level up to the $500s. In addition to the superior construction of its homes, the Palms at Casey Key charms prospective buyers with its low-key, low-density South County setting which is nevertheless convenient to all the best that Sarasota has to offer. From this community, easily accessible only about a mile north on the Tamiami Trail is a Walmart Supercenter. Adjacent to it is the Bay Street Village & Towncenter which is home to some trendy café and restaurants. 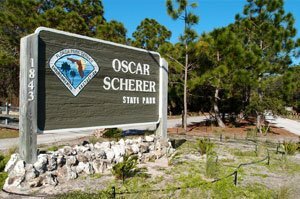 A public park in this area north of the Palms at Casey provides picnic grounds and nature trails, just a preview to even more outdoor delights available at the Oscar Scherer Park accessible via the Tamiami Trail south of the community. Social activities, golf and tennis can be enjoyed too with a membership at The Oaks Club north of the Palms at Casey Key. Living in this community is further spiced up by its proximity to the 10-mile stretch of the Legacy Trail ideal for biking and running either northward to Sarasota or southward to Venice. Fun-filled outings to the beach are as convenient. The Nokomis public beach is but a five-mile drive whether via the Tamiami Trail or right on the scenic road of Casey Key upon which the market franchise of this CalAtlantic development is based. Below are the current real estate listings available at The Palms at Casey Key.